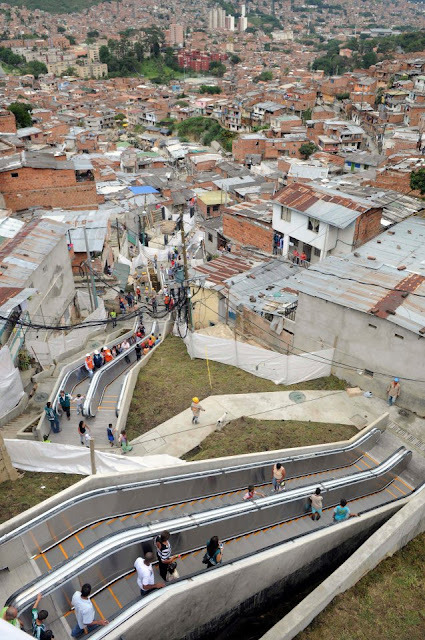 Officials in Colombia's second-largest city inaugurated a giant, outdoor escalator for residents of one of its poorest neighborhoods. For generations, the 12,000 residents of Medellin's tough Comuna 13, which clings to the side of a steep hillside, have had to climb hundreds of large steps authorities say is the same as going up a 28-story building. Now they can ride an escalator Medellin's mayor says is the first massive, outdoor public escalator for use by residents of a poor area.Comuna 13 residents came out to celebrate and study the $6.7 million escalator which officials say will shorten the 35-minute hike on foot up the hillside to six minutes. Use of the escalator is free.The electric stairway is divided into six sections and has a length of 384 meters (1,260 feet). An escalator goes up and a second goes down. Authorities plan to build a covering for inclement whether.